ASI Environmental strive to deliver the very best results for every client, from home owners to major facility management companies, across the UK. Our UKAS accreditation demonstrates our competence and integrity when carrying out asbestos surveys, and testing for asbestos, in a reliably credible and accurate manner. We believe that vital team safety training should be regularly undertaken; this ensures our employees are working in safe and manageable environments. Regularly exposed to high risk environments, we carefully monitor our surveyors and their safety training, ensuring it is not only up to date but of the highest professional standards. With this in mind, we set out to find a company that could provide our team with bespoke training courses that were outside of our own remit, but worked in tandem with tasks that we can be called upon to perform. We came across MRS Training & Rescue Southampton. MRS (formerly known as Mines Rescue Service) has provided specialist safety training for over 100 years. The ASI team took part in MRSL’s intensive Confined Space Training course, which gave a greater understanding of the critical dangers faced when working in a confined space and also how to deal with the risks in such environments. • Working with others in high risk confined spaces. We found the course to be very informative, allowing our team to improve upon existing knowledge as well as learning new, beneficial information. We plan to maintain our standard for excellence through continued learning. ASI Environmental carry out four stage clearance air testing and asbestos surveys in a wide range of residential, commercial and military settings; this can mean accessing restricted and confined spaces. For example, we have just carried out work in a large 200-metre-long void between walls in a large college in London, also within underground service ducts, following pipework runs. 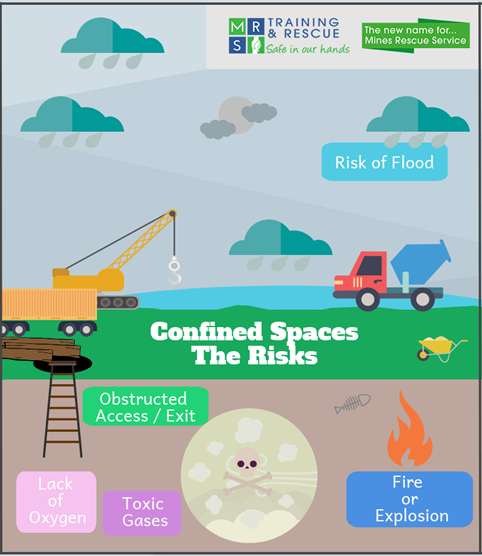 This calls for our surveying teams to not only be aware, but fully conversant in dealing with the risks associated with confined space. To talk about how we can provide you with a quality service, regardless of environmental challenges, give us a call today.